It’s hard to believe, but summer will be here before you know it. If you’re wondering how you’re going to keep your children learning and exploring once school is out, let me introduce you to a summer experience with the fun and learning you’ve come to expect from Kiddie Academy® Educational Child Care. CampVentures® is Kiddie Academy’s school-age summer camp program and curriculum. The program mixes learning with lots of fun summertime activities, including time on our playgrounds, splashing in water, messy art projects, going on field trips and welcoming special visitors at our Academies. Currently enrolled children also participate in CampVentures. They’ll enjoy hands-on, self-directed activities relating to familiar themes they’ve been introduced to during the school year. Two-year-olds will learn through fingerplays, songs, movement activities and quality children’s literature, including books that promote sign language and Spanish. Our 3- and 4-year-olds will take in-depth looks at real-world topics relevant to them. They’ll also take part in STEM and arts activities. CampVentures uses a project approach to learning. The project approach is a great way to involve children in directing their own learning while investigating topics they help choose. Teachers have flexibility and are encouraged to follow the children’s lead as they plan fun and interesting activities for summer learning. Teachers will prompt students to use their imaginations, create their own solutions and investigate themes as they guide the learning process. The children arrange a culminating event or project that not only displays their work but celebrates their achievements. Turn your child’s ordinary summer vacation into a summer of exploration. 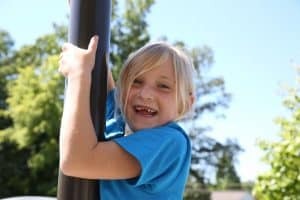 Find out more about how CampVentures will awaken a world of fun, learning and friendships for your child.